As a rule, art generally doesn’t gain value, audience, or meaning on its own. It takes someone to believe in it, to understand why it resonates, and to make a commitment to standing behind it. This can be an enormous task, especially when dealing with a body of work that enters the world with no inherent value. If a photographer has no name, no history, and no show record, is it reasonable to consider that his or her photographs were never intended to be “Art” at all? In the case of Livija Patikne, the elderly tenant whose photographs fell into Brozek’s hands, there wasn’t much evidence that she could be considered a photographer at all. Because she passed away in 2001 and left no written guide to her works, her motives for taking the photographs and desires for what should be done with them simply disappeared. At the time, Brozek didn’t know much about Patikne; all he had were the images she created. Yet he found themes in his own photographs that aligned with hers—not because of subject matter but because of the emotional undertow of the work. Both photographers infuse their images with a subtext of loss; both use the medium to capture the place where the momentary meets that great big gulf of extinction we call the past. Brozek’s work tends to involve lengthy, thematic meditations. He leans toward subjects that allow us to see the passage of time, focusing the viewer’s attention on things that are just on the edge of becoming anachronistic, things that are tipping out of progressive chronology. Brozek initially shared Patikne’s slides with me in the 1990s, while I was curating a show for a nonprofit art center. I thought they were the most still still-life images I had ever seen, frozen in the 1950s and arrested with a kind of stark beauty. Several years after I started my own art gallery in Milwaukee, the Portrait Society Gallery, Brozek stopped in to visit me. Again he brought the box containing Patikne’s photographs. The images intersected with my interest in self-taught art and art that exists outside of conventional gallery/museum structures. But the fact that Patikne was a woman, making art privately, without expecting validation, won me over. We agreed to mount an exhibition of her work. However, we didn’t know where to begin. All we had were a few of Patikne’s self portraits and the clues we found in the hundreds of staged images of flowers posed like human subjects, some drooping, some ecstatically overflowing and perky, others lonely with only empty space to frame them. For us, the flowers seemed to take the place of Patikne’s vanished life, but the images offered only vague points of conjecture about her personality and intentions. In addition to photographing these lonely floral arrangements, Patikne photographed herself along with flowers that she would later leave on the grave of her husband Karlis, who had died in 1959. She also did a series of self-portraits in various floral dresses that we guessed were of her own design. 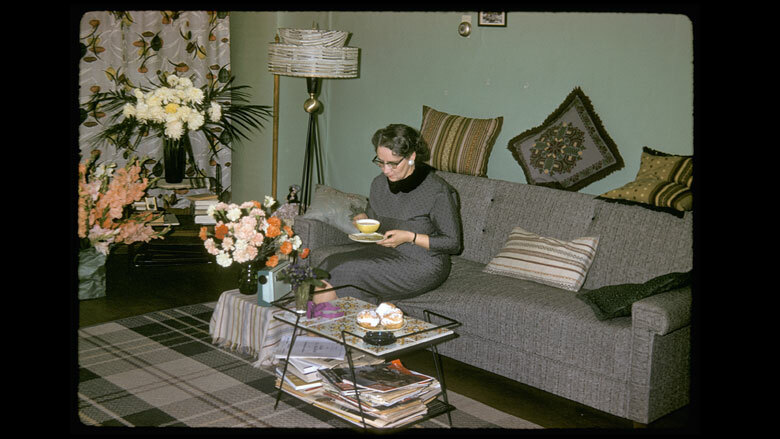 As these three discrete subject areas—images of floral arrangements, graveside compositions, and domestic scenes in formal dress—arose from the examination of the slides, it dawned on us that perhaps Patikne took these photographs during the 1950s and 60s as a kind of private artistry, a means of expression within her own little world. One analog for understanding Patikne’s private artistry is the case of another deceased female photographer whose work was recently discovered and championed to great success. Vivian Maier worked as a nanny but spent much of her free time wandering the streets of Chicago with her camera in search of images. Between 1950 and the late 1990s, she meticulously and quietly cataloged interesting bits of Americana—the demolition of historic landmarks for new development and the unseen lives of the marginalized, as well as some of Chicago’s most cherished sites. A young real estate broker named John Maloof purchased a box of 100,000 of Maier’s negatives for $400 at a thrift house auction in 2007, hoping they might be valuable for a book on Chicago’s history that he was co-authoring at the time. While the images turned out not to be of much use for the book, Maloof later returned to the negatives and realized he possessed something unimaginably precious. He began printing and posting Maier’s photographs to a blog in 2009. Since then, her work has gained a huge following, with shows on both coasts, two books of her photographs, and prints selling for up to $5,000 each. Livija Patikne has none of this going for her. She was a reclusive woman who lived alone on Newhall Street in Milwaukee for thirty years, working for much of this time as a bookkeeper. Her photographs do not fit a lionized genre like street photography. Instead, Patikne took decidedly womanly photographs, mostly within the domestic radius of her home and the cemetery where her husband lay. No category of photography exists for women and their day-old roses, just as there isn’t an academic discipline or textbook chapter dedicated to the examination of images that strain to speak of a gender-specific interest in life’s fragility, rites of passage, loss, remembrance, and loneliness. Where street photography reflects the immediate and the external—sandwiched somewhere between time, place, and urban drama—these still-life arrangements are the opposite. They are interior images lit with emotion. They recall the sometimes sad timbre of womanhood: the meals served, loved ones buried, birthdays marked and celebrated, babies held and comforted, life forever passing. With all this in mind, Patikne’s photographs may never become more than somber markers of the fact that women have struggled to establish their own chapters of art history. “Women have been actively involved with photography ever since the medium was first introduced in 1839,” argues Naomi Rosenblum in A History of Women Photographers. Yet she points out that “because the selection of what shall be remembered has been done throughout most of photographic history by male scholars, women tended to be dismissed or slighted.” In particular, female artists who deal with gendered subjects, such as flowers or child rearing, fail to leave a lasting impression on the art world. A woman in the 1950s, like Livija Patikne, who engaged in a sustained practice of photographing her domestic life, was essentially involved in a transgressive act, one that is too easy to dismiss as unimportant. Patikne’s sweet and sad floral arrangements, at first glance, fall within the prescribed role of hobbyist housewife—harmless conceits occupying a middle-aged woman’s spare hours. But what if each floral arrangement and each self-portrait, embodying the assertive act of naming and staging, represents an affirmation of life and beauty? What if every click of the shutter is a validation of self? When Patikne photographs a new set-up, she is recording her own imprint along with the flowers’. She is saying what other women of her generation often could not: This is who I am. This is what I value. This is how I see. Few are accustomed to the idea of art being made outside the circles of established artists or academic institutions. Sometimes people make do with the slim means available to them for expression: they build with junk and found objects or take up a craft like quilting or knitting. But rarely do these earnest hobbies move into uncharted creative zones that lie outside an otherwise conventional life. When individuals pursue a private artistry, as Patikne did, the work often falls into the categories of cliché, naïveté or, more rarely, a visionary expression of a certain predisposition—what is known as outsider art. Self-taught artist Eugene von Bruenchenhein was a Wisconsinite who made paintings and sculptures. Today considered an outsider artist, von Bruenchenhein also created a large body of photographic portraits of his wife Marie that have acquired great value. The self-taught Chicago painter Lee Godie took photo-booth portraits of herself as well. Apart from these two, though, self-taught or outsider photographers are rare. Livija Patikne could be said to fit somewhere in the broader field called “vernacular photography,” among the legions of anonymous individuals who take slightly quirky or charming pictures of Christmas dinners, late-night parties, or family antics. But I think she slips just outside those borders, into an almost nameless category. As she imagines, stages, and creates her own images, she applies just enough agency to penetrate the membrane of the art world. Her photographs even suggest that she may have had art school or photography training. In one still-life arrangement, Patikne places a bunch of flowers within an open box of photographic paper, alluding to a self-definition as a photographer. Patikne repeatedly changed the set-ups, angles, and lighting as she staged the flowers, sometimes shooting upward and sometimes down. The same household tables, chairs, wallpapered or curtained backgrounds, pieces of fabric, vases, and rugs rotate through the compositions. Part of her artistry was the act of turning a simple end table, lace tablecloth, carpet pattern, or refrigerator top into something elegant and interesting. Photography was the tool that gave these humble furnishings touches of the symphonic. It’s this symphonic flourish that harkens back to the floral still lifes that originated in Europe in the 1400s. The still-life genre became increasingly popular during the early 1600s as trade routes expanded and the commercial world rose in prominence alongside the church. First appearing on the backsides of religious triptych panels, still-life paintings would later function more broadly as vanitas, reminders of the transitory nature of life and the sin of vanity that exhorted the viewer, Memento mori, “Remember, you will die.” The sumptuous fruit and flower paintings served to awaken the viewer to his or her own perishability and the need to balance the material and spiritual worlds. Still-life paintings represented the sensual but fleeting fecundity of our everyday lives as well as the eternal plane of the soul. Patikne’s plaintive flower photographs speak of these dimensions, as if the history of the vanitas genre still perfumes them. Her images are the kind that might appeal to people with a proclivity for that special place where the mundane becomes elegiac, reminding viewers of the opening and closing scenes of David Lynch’s 1986 film Blue Velvet, where a white picket fence, blades of grass, and swaying yellow tulips are foils for the churning darkness just under the surface of a seemingly placid community. For Patikne, whether intentional or not, these images embrace the aesthetic described by the Japanese term mono no aware, a kind of beauty tinged with the sadness of impermanence. Her solitary flower arrangements feel a little lost, like celebrations without guests. The lushness of the flowers stands in contrast to the terseness of the often rather empty compositions, as if she succinctly tucks human hope and suffering into a little vase on a small table or atop a piece of Latvian woven cloth. And the more we look, the more it becomes clear that Patikne is making art. These are not snapshots; they are ideas. The art critic and historian Arthur Danto once asked: “Why do we bring flowers to a funeral? What is the association of beauty with death, or with grieving?… Perhaps we need a contrast to our grief, a small pleasure in the face of an overwhelming pain, a surcease from mourning that yields a kind of distance or perspective.” Like the still life images of flowers, we can read Patikne’s cemetery photographs as ruminations on life and death—but not in the way you might think. In one photo, Patikne stands beside her husband’s grave. She wears a patterned dress and black hat and holds black gloves. Patikne tilts her head gracefully downward, toward the spot where her deceased husband Karlis lies. She has refreshed the urns with a bouquet of yellow daisies and two smaller groups of white flowers. In the background, a fresh grave similarly overflows with flowers. The slim lines of the trees mirror her erect stance as well as the verticality of the flowers in the foreground. It is a well-composed picture. Many widows have struck this pose over their husbands' graves, but Patikne elevates the moment, infuses it with deliberate elegance. The camera is distant enough that the surrounding cemetery appears in the frame, and therein she arranges the living and the dead into an ordered, comprehensible composition, not unlike the way she sets up any other still life in her home. One must imagine this as a solitary act, with the camera on a tripod as the only witness. In another image, Patikne wears a polka-dotted dress and white hat and assumes a similar stance but holds a large bouquet of yellow daisies—Latvia's national flower—before a freshly dug grave. Both images look like film stills as Patikne performs a role, using the camera to bear witness to her ministrations to the graves. Patikne stages grief and orchestrates pictures about loss, almost as if the picture is the tribute to the dead rather than the act of visiting the gravesite. Perhaps Livija Patikne enjoyed being an actress in her own life, the distance of the performance providing emotional safety. It is easier to play the fashionably sophisticated widow than to really be the aggrieved wife. The images freeze a sentiment of eternal mourning, extending and broadening a private act into a prolonged universal relationship with the grave, with death. Although some autobiographical hints appear in her compositions, even Patikne’s self-portraits do not seem to be about the self. Rather, these images convey more broadly narrative, cinematic themes. There is a hint of the contemporary conceptual photographer Cindy Sherman in Patikne’s self-portraits, in the way she uses clothes as costumes and adopts “roles” that seem lifted from magazines or films of her time. Just as Sherman might assume the guise of an actress, a clown, or an aging socialite—not to portray individuality but to show how culture shapes human identity—Patikne doesn’t take pictures of herself to better see or know herself but simply to use herself as a model, distancing identity and inviting whatever narrative takes its place. The self-portraits that Patikne stages in her home are clearly narrative-based. She stands in a flower-patterned dress, staring down at the telephone, waiting for it to ring. She sits on the couch with a cup of coffee. A plate of pastries on a nearby table suggests the impending arrival of a guest. Her yellow coffee cup compositionally responds to the one deep yellow flower tucked in a second vase in the background. Again and again, we see Patikne in different outfits, deliberately staging herself within her apartment. Livija Patikne is not a conventionally beautiful woman, yet something gave her the confidence to consider herself worthy of a self-portrait, when so many other women of her generation remained invisible. Perhaps when life does not unfold as one might wish, art becomes a means of controlling the story, of superimposing another, happier narrative. If, as John Berger states, the most popular use of the photograph is as “a memento of the absent,” then Patikne’s work fits the criterion of popular photography. But I would go one step further than Berger by invoking French philosopher and literary critic Roland Barthes. Photography, Barthes writes, allows us to “compute life, death, the inexorable extinction of generations. … The photograph is without future (this is its pathos, its melancholy).” Within this grand yet extremely human trifecta of absence, pathos, and melancholy, we find Patikne’s pictures. Livija Patikne was born in Riga, Latvia, on December 21, 1911; she died in Milwaukee on February 17, 2001. It is quite remarkable that her photographs today hang on the walls of a gallery. Perhaps even more remarkable is that Livija’s work survived her death and the subsequent dismantling of her apartment. The caretaker happened to know a photographer and offered him the slides; the photographer, with no great motive, decided to keep the slides—for fifteen years, until an exhibition at the Portrait Society Gallery provided a platform to share this work with the public. In 2011 an exhibition of Livija’s photographs was held at the Portrait Society Gallery in Milwaukee as part of a larger show that examined the demise of Kodachrome film. The gallery also presented some of Livija’s images at the 2011 Intuit Show of Folk and Outsider Art in Chicago. Jim Brozek and I guessed that Livija Patikne had a life of many challenges, but what we learned shortly after the Portrait Society Gallery exhibition infused her images with a new layer of meaning. After the Milwaukee Journal Sentinel ran a review of the exhibition, Livija’s niece and nephew visited the gallery. They had not seen their aunt for many years and were shocked to see a photograph of her in the paper. As she aged, they said, Livija became increasingly unpleasant to be around, making visits awkward. They were greatly appreciative, however, of the exhibition of her pictures, most of which they had never seen. Livija's niece and nephew told us that Livija and her husband Karlis Sirmbardis fled Riga, Latvia, when the Soviets swept through Eastern Europe during the Baigais Gads (Year of Horror) in 1939. Educated and middle class, they likely had a comfortable life. Yet they had to leave everything behind to escape the mass arrests, disappearances, and deportations that were an everyday occurrence in Riga during this time. The couple spent four years in a refugee camp in Germany before receiving permission to relocate to America. They left Europe on October 9, 1943, on a ship called the Grand Muir bound for the United States. By then Livija was 32. She could not have children. She had left behind her mother and a brother who died during the war. Livija and Karlis first settled in Ohio and ran a grocery store in Springfield. Livija also worked for Kodak there, a job that may have sparked her interest in photography. They later moved to Milwaukee. Karlis died of cancer on his 49th birthday in 1959. In the late 1960s or early 1970s, Livija married Antons (Tony), another Latvian man, in Milwaukee. Described by the family as “uncultured,” Antons was soon diagnosed as schizophrenic and institutionalized. He had accused Livija of poisoning his cottage cheese. Like Livija’s first husband Karlis, Antons also died young. After his death, Livija lived alone on Newhall Street for the remainder of her life. The building caretaker said that she was always eager to chat and that she enjoyed craft projects. In the middle of one night, he found her in the street, screaming that the Nazis were coming. She was hospitalized shortly after this incident and then put in a nursing home where she died, alone and forgotten. Perhaps history will forget Livija Patikne as well. The writing about art and the history of photography have told us that Livija’s slides are not of value. But what of that small glass vase with two pink roses, one turned toward us, the other bending away? They cast deep shadows, an umbra of existence on the greenish wallpaper of a seemingly empty room. It could be said that flowers, for Livija, held a radiance that nothing could diminish. Despite tragedies, losses, and economic hardship, this vase of flowers could still summon a moment of grandeur. The sadness and heartache are there, but so, too, is the beauty. That inextinguishable beauty is the certificate of presence, testifying to the life and private artistry of Livija Patikne. Check out Flowers by Livija, an exhibition of her photography selected by James Brozek and the Portrait Society Gallery at the James Watrous Gallery. Debra Brehmer is a writer and art historian who runs a contemporary gallery called Portrait Society in Milwaukee. Brehmer teaches at the Milwaukee Institute of Art & Design and she is especially interested in how portraits convey meaning.